Photo by Incase Creative Commons, Attribution 2.0 Generic. Want to show your art in a gallery, but have few or no ideas where to begin? Getting into a gallery is much more than having enough inventory, and it can be difficult to navigate the process without a knowledgeable guide. Crista Cloutier–the art business expert and consultant behind The Working Artist–is just the guide you need. This talented multi-hyphenate–with titles including artist, gallerist, and fine arts appraiser–has sold artists' work to art galleries across the world. She now spends her time helping fellow artists to achieve success and create a thriving business. 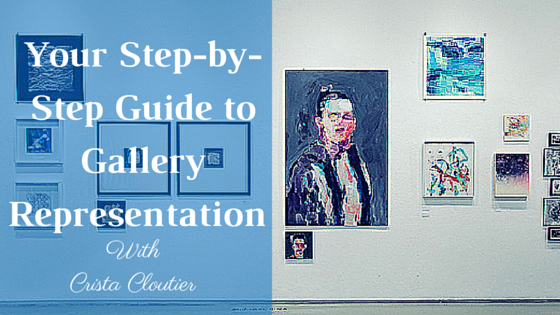 We asked Crista to share her expertise on how to achieve art gallery representation. The first step is to remember that art galleries aren’t the be all and end all of selling your art. There are many, many other opportunities out there, so don’t get hung up on showing in a gallery. Getting into the gallery that you want could be a long term goal. So, be patient and build your career and build your audience with that end result in mind. The very first thing that an artist should do is research. Just because a gallery sells art, it doesn't mean they should sell your art. A gallery relationship is like a marriage–it’s a partnership–and it has to work for both sides. A gallerist is usually a creative themselves and they have their own aesthetic, interests, and focus. Doing your research means finding out which galleries make the most sense for your artwork and career goals. It’s important to develop a relationship with the gallery that you want to show in. That means signing up for their mailing list, going to their events, and finding out what it is they need that you could give. I recommend showing up to gallery events more than once, having business cards, and challenging yourself to have at least three conversations while you’re there. And, understand like any relationship that it just takes time. Stay open to whatever fate brings you. It’s also critical to treat everybody there like they’re potentially your best client. You never know who could be best friends with the gallerist or actually be the gallerist. By judging or dismissing people, you’re missing out on what the whole relationship and audience building is about. The decision maker gets hammered all the time, so by being part of the gallery’s tribe you’re getting to know the people in the sphere of the decision maker. When I considered a new artist as a gallerist, it was almost always because another artist I worked with or one of my clients told me about their work. It’s essential to know how to talk about your work. The best way to do this is to make sure your work is about something. If your work is about self-expression or personal feelings, dig deeper. Writing your artist statement helps you form your ideas and put language to them. It’s important to put language to your ideas, both in your artist statement and in your conversations. I once introduced an artist to a collector, and she asked him what his work was like. He mumbled, “I used to work in acrylics, but now I work in oils.” She was actually insulted because that’s all he said. There was no where for that conversation to go. Many artists say, “I don’t like to talk about my work” or, “My work explains itself”, but it doesn't. Your work doesn’t speak for itself. You need to give people a place to come into it. The best way to sell art is to have a story for it. The story can be technical, emotional, inspirational, historical, anecdotal, or even political. And while not many galleries do studio visits anymore, you’ll want to be prepared to talk about your art if they do. Be sure to have a 20 minute presentation at the ready, with food. You need to know exactly what to say, what to show, the order to go in, your prices, and the stories that go with each piece. Make sure you have your own audience to bring to a gallery. This is something you can build yourself, especially through online tools or at events. Create mailing lists and a following, and keep track of the people who show interest in your work. An artist should always be building their own audience and be able to keep control of that audience. You have to be filling the gallery with people too. You have to work just as hard as the gallery does to promote your events and tell people where they can find your work. It is a partnership, and the best partnerships are when both people are working just as hard to get people in the door. ARTWORK ARCHIVE NOTE: You can learn more about this in Crista Cloutier’s free e-book 10 Divine Secrets of Working Artists. Download it here. Once you’ve established a relationship, find out what the gallery’s submission policies are. This is one place where you don’t want to break the rules. I know as artists we always break the rules, but don’t break the rules on submission policies. As far as your submission materials, make sure you have good, solid ones. Have high-quality, cropped images that include the work’s title and dimensions. It’s a good idea to have an online portfolio as well as a hard copy, so you’re ready for anything. It depends on the submission policy, but it’s also good to have your biography, CV, and artist statement ready when you start to hone in on galleries. You’ve got to have your own website too. It is expected and is a sign of your professionalism. Artists often complain to me about having to pay a gallery 40 to 60%. I think that’s really the wrong way to look at it. They’re not taking anything from you, they’re bringing you clients, so pay your commissions joyfully. However, you want to make sure that if they are taking a big percentage, they are earning it and giving a lot more in exchange. Hammer out what a gallery is going to do for you as far as public relations and marketing in contract negotiations. If they’re getting half, you want to make sure they earn it. You want to know what they’re doing to make sure your art gets in front of the right people. But, at the same time you need to do your bit too. Remember that failing to get into a gallery just means it didn’t work out this time. Vik Muniz is an artist who’s had incredible success in the art world and he said to me once, “When I succeed, it's that time I failed to fail.” You have to fail a hundred times before you succeed, so just focus on failing better. Don’t take it personally and don’t quit. Figure out what went wrong, what you could do better, and repeat. Want to Learn More from Crista? Crista has much more advice on the business of art on her brilliant blog and in her newsletter. Her article on How to Sell Your Art is a fantastic place to start and be sure to sign up for her newsletter here. Consider Yourself a Go-Getter? Sign up for Crista’s Working Artist Masterclass. Class starts Nov. 16th, 2015, but registration is open until Nov. 20th, 2015. Don’t miss this great opportunity to gain valuable skills and knowledge to fast track your art career! Artwork Archive members who use the special coupon code ARCHIVE will receive $37 off the registration fee for this session. Learn more here. Professional reports are a great way to showcase your professionalism to buyers and galleries. Impress with these 5 reports—and find out how to easily create them! If you put in the work, it will lead to something. Why habits pay off more than inspiration in creative work.